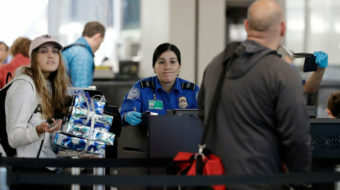 WASHINGTON – Despite huge past problems with electronic verification of Social Security eligibility, the union representing the system’s workers says the Social Security Administration (SSA) is charging ahead with a plan to force almost all recipients into Internet-only communication. And that could endanger benefits for millions of people, adds the American Federation of Government Employees (AFGE). Witold Skwiercznyski, President of AFGE’s National Council of Social Security Field Operations Locals, told the Senate Special Committee on Aging on June 18 that SSA had the National Academy of Public Administration (NAPA) develop the Internet-heavy scheme, and that wants to impose NAPA’s “Vision 2025” plan in the coming decade – without input. By then, he added, there will be at least 11 million more Social Security recipients, many of whom, like current recipients, are not computer-savvy and who could be victims of identity theft. He noted tens of thousands of people already reported unjustified denials of benefits and identity verification problems with Irish-based Experian Company, operator of MySSA, the cranky Internet-only verification system Social Security now urges or orders recipients to use. “Forcing, coercing or offering” Social Security recipients “a computer option when they came to the office for face-to-face service is frustrating to the customer and certainly does not constitute good public service,” Skwiercznyski said. 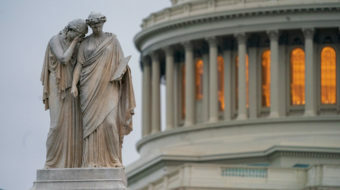 The union’s warning comes as both the Democratic Obama administration and Congress’ ruling Republicans consider plans to reduce future Social Security benefit increases, by raising the retirement age to 67, imposing smaller yearly cost-of-living benefit hikes, or both. That huge battle – which has drawn the ire of unions, the Alliance for Retired Americans and others-overshadows the problems of managing the system itself. Social Security officials justify pushing clients towards an electronic, Internet-heavy system by saying it will reduce administrative costs. Going electronic, they say, will let them close dozens of Social Security field offices – on top of the 80 shut since 2010 – and let another 30,000 workers leave. SSA has already cut 11,000. AFGE represents the workers. Skwiercznyski retorted that SSA, partially due to “unintentional” past budget cuts, is already short-staffed. And those who get hurt by the pro-Internet drive will be Social Security recipients, millions of whom depend on their monthly payments as their top or sole income. Skwiercznyski painted a bleak picture of a Social Security Administration already straining under a workload of 43 million yearly face-to-face visits and more than 68 million phone calls. The number of face-to-face meetings has not declined since 2005, despite closure of the field offices, elimination of 11,000 jobs and all 500 rural contact stations, a 28 percent cut in office hours, and Social Security’s push to get recipients to use the web. “SSA is at a crossroads with one path leading to an Internet portal and the other maintaining personal service to millions of Social Security beneficiaries,” he told senators. “While the union believes SSA must move down both paths simultaneously, it is clear the agency sees only one way forward: Americans in the next 10 years will use the Internet alone to access SSA benefits and services. “Does this strategy make sense? The union says no, the SSA managers association says no, but to date, the policy remains unexamined by Congress and unexplained by SSA. Eliminating unneeded management layers, with those workers transferred back to processing claims and helping customers. SSA’s 42 area offices should top the list, he said. 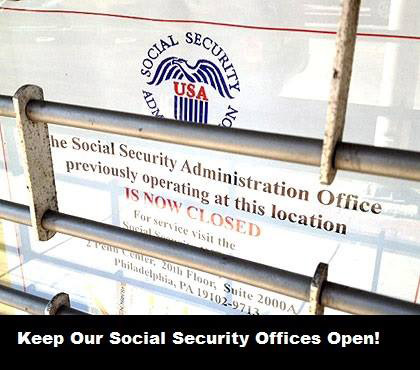 Ban closing Social Security field offices without 30-180 days advance notice and public hearings. 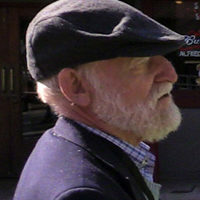 Skwiercznyski noted the Postal Service must give months of advance notice about closing local post offices, and asked why SSA can’t do that, too. Post office closings are controversial. AFGE supports legislation by Reps. John Duncan Jr., R-Tenn., and Brian Higgins, D-N.Y., for a moratorium on SSA office closings. SSA has 1,200 field offices. Reconsider using Experian. “In October 2013, Experian was caught selling U.S. data, more than 200 million accounts, from their Identify Proofing Services to an Identity theft ring. Experian is being investigated by the Secret Service and FBI. It has since been reported the ring operated throughout New York and New Jersey.” More than a dozen states are suing Experian for permitting identity theft. “As details from testimony are made known, it becomes clear that five out of six U.S. adults are at risk,” Skwiercznyski warned. “SSA should not embrace a business model of ‘acceptable risk’ with regards to (Social Security) number holders and beneficiary’s personal identifiable information housed on SSA’s data base,” or whether it agrees with Experian’s data, he added. Reconsider making the Internet the lead way Social Security recipients communicate with the system. One-fifth of U.S. adults do not know how to use it, one-fourth of white Americans and more than 40 percent of African-Americans lack access to it, he said. “In our most recent survey of employees, over 55 percent of Internet claims filed require re-contact due to erroneous or missing information. Often, these errors are never corrected…SSA should not dictate what kind of service the public should receive,” Skwiercznyski said.